Cast: Edward Furlong, Anthony Edwards, Jason McGuire, Clancy Brown, Jared Rushton, Darlanne Fluegel, Lisa Waltz, Sarah Trigger. Rated: (for strong violence, and for sexuality and language). I've never had anyone die before...but I guess you get over it. I mean, eventually. No. No, you never get over it. "Pet Sematary II" is a needless sequel, but a pretty good one all the same. Returning director Mary Lambert stays true to the conceit of the original, treating the characters as players in a slice-of-life that turn tragic when death invades their existences. When his movie actress mother Renee Hallow (Darlanne Fluegel) is suddenly killed in a freak on-set accident, 13-year-old Jeff Matthews (Edward Furlong) and veterinarian father Chase (Anthony Edwards) relocate from L.A. to Renee's hometown of Ludlow, Maine. Struggling to come to terms with his mom's passing, Jeff makes friends with classmate Drew Gilbert (Jason McGuire) while attempting to fend off school bully Clyde Parker (Jared Rushton). 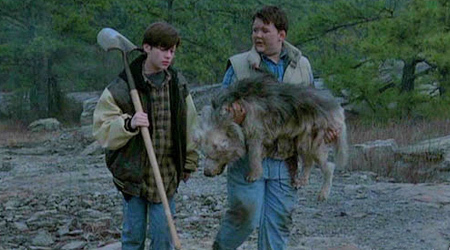 When Drew's dog is shot and killed by police stepfather Gus (Clancy Brown), Drew talks Jeff into helping him bury the pooch on the Indian burial ground beyond the local pet cemetery. The canine's resurrection complete, it paves the way for an increasingly horrific and out-of-control series of events that will find Jeff and Drew fighting for their lives. "Pet Sematary II" has a solid cast, a festive autumnal atmosphere, and a great accompanying soundtrack featuring Dramarama, L7, The Jesus and Mary Chain, and The Ramones. The film works so well as a teen drama in the first half that it's almost a shame when the more over-the-top horror elements come into play. Director Lambert does a fine job carrying over the predecessor's themes about the mysteries and fears of death and grief, but oversteps things with messier plotting and a few too many strained one-liners in the third act.